Identity « Global Market Insights, Inc.
With global enterprises rapidly embracing cloud platforms as well as other networking technologies, cybersecurity market is anticipated to observe a massive upscale in revenue. As more and more organizations transition into the cloud and work to minimize security risks, making the enterprise network less vulnerable to a plethora of cyber-attacks, the average annual spending on cybersecurity is expected to rise significantly. In fact, back in 2017 the average spending on cybersecurity solutions by organizations went up as much as 23% accounting for more than $11.7 million. This increasing cyber security budget in several organizations globally is expected to be one of the most prominent growth inducing factors propelling cybersecurity market. While the topic of cybersecurity once received perfunctory response from global governments, the scenario has undergone a drastic change today. A number of nations have increasingly begun looking for ways to protect their government agencies from malicious attacks by boosting their cybersecurity preparedness efforts. The potential of the threat is so much that in 2018, the World Economic Forum launched Global Centre for Cybersecurity to protect the world against hackers. These cyber security efforts were further magnified in late 2018 when more than 50 countries signing an international cyber security principles agreement that aims to put an end to malicious cyber-activities in peacetime – an act that is bound to significantly drive the growth prospects of cybersecurity industry. As businesses worldwide undergo a digital transformation, wherein they move the critical applications of their enterprise network onto the cloud, the issue of cybersecurity has garnered mainstream attention. The digital transition has undeniably allowed organizations to significantly improve their operating efficiencies, but has also made them vulnerable to a plethora of cyberthreats that could bring their operations to a grinding halt if they fail to manage the security risks properly. In fact, according to Telstra, over 59% organizations across Asia experience a business-interrupting cyberattack at least once a month due to inadequate cyber security measures. Driven by the threat potential of cyberattack more and more large enterprises are embracing cyber security solutions. Indeed, large enterprises accounted for over 60% of the global cybersecurity market share in 2017. It is also prudent to mention that 2017 was witness to one of the biggest cyberattacks ever, where the WannaCry ransomware, which affected over 400,000 machines across 150 nations, cost the world approximately $4 billion in losses. Large enterprises on an average lost over $10 million because of cyber security breaches. Prompted by the WannaCry attack, that enabled the average cyber-attack cost to rise as much as 11%, enterprises were further encouraged to embrace more advanced security solutions. The cybersecurity market is also expected to attract sizable gains on account of the growing Bring Your Own Device (BYOD) trend, wherein businesses are allowing their employees to utilize their personal devices on the job. How has the new U.S. national cyber strategy impacted the cybersecurity industry trends? The United States of America has been facing consistent threats from an increasing number of highly-sophisticated malicious entities that are motivated by a whole host of different factors ranging from ideological & political interests to espionage & financial gains. The Armed Forces Communications and Electronics Association (AFCEA), in September of 2018 had pointed out that the U.S. government did not possess a comprehensive cyber security strategy leaving U.S. critical infrastructure and federal agencies extremely vulnerable to cyberattacks. In the days that followed, the Trump administration released the National Cyber Strategy, the nation’s first, fully-articulated cyber strategy in over 15 years. Propelled by the cyber strategy, in conjunction with the rising adoption of cybersecurity solutions by an extensive number of enterprises spanning the nation, the U.S. cybersecurity industry is anticipated to crop up as one of the most prominent regional markets over 2018-2024. It is rather overt that the global cybersecurity market is well positioned to establish itself as a lucrative investment ground. 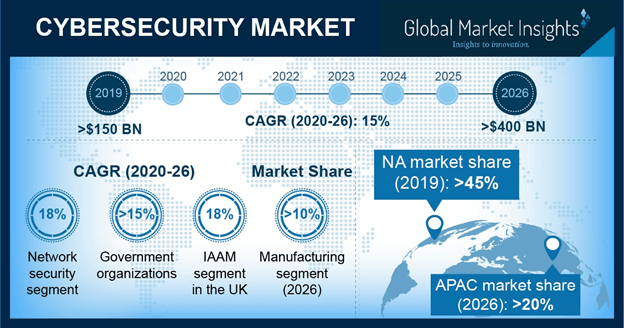 As per Global market Insights, Inc., cybersecurity industry size, driven by the growing number of cyberthreats that are frequently cropping up, is anticipated to be pegged at $300 billion by 2024. This entry was posted in Sustainable & Smart Technologies and tagged access management, Authentication and Access Management, Banking, Cloud Security, Consultancy & Training, Cybersecurity Market, Cybersecurity Market Analysis, Cybersecurity Market Landscape, Cybersecurity Market Overview, Cybersecurity Market Report, Cybersecurity Market Segments, Cybersecurity Market Share, Cybersecurity Market Size, Data Loss Prevention, DLP, Email Gateway, Endpoint Protection, Firewall, Global Cybersecurity Market, Government, Hardware Support, IAAM, Identify Access Management, Identity, Implementation, Infrastructure Protection, Insurance, Internet Service Provider Equipment, IT & Telecom, Large Enterprises, Managed Security Services, Manufacturing, Network Security, Securities, Security Information and Event Management, Security Services, SIEM, SME, Transportation, Unified Threat Management, UTM, Virtual Private Network, VPN, Vulnerability Management, Web Gateway.